Located in northern Vietnam, Hue is a popular party destination among backpackers; however, the city offers much more than cheap beer! Once used by the Nguyen Dynasty as the country’s capital city, Hue is home to unique imperial architecture, as well as the beautiful Perfume River, surrounded by scenic mountains. Sometimes referred to as Vietnam’s version of China’s Forbidden City, Hue’s Imperial Citadel is the city’s main must-see landmark. The Imperial Citadel is a must-see in Hue. Located on the northern bank of the Perfume River, and spread across five square kilometers, the Imperial Citadel is home to a series of beautiful temples and other buildings that were used by the Nguyen Dynasty in the 19th and 20th centuries. 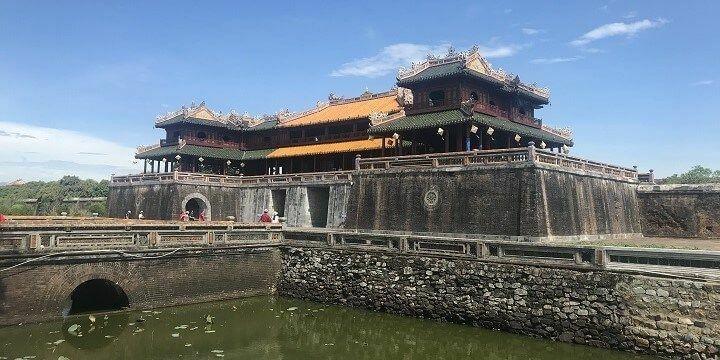 Now a UNESCO world heritage site, the Imperial Citadel is easily reachable from Hue’s city center via a short walk across the river’s main bridge. There are plenty of ways to explore Hue’s royal tombs: take a dragon boat along the Perfume River, hire a motorbike, or take a bus tour. The largest of the royal tombs is the Minh Mang Royal Tomb, which is home to 40 monuments across 180,000 square meters of scenic grounds. The smaller ones, such as Tu Duc Tomb and the Royal Tomb of Thieu Tri, are also impressive, so try to visit as many as possible! The Minh Mang Royal Tomb is home to 40 monuments. If you choose to explore the tombs via dragon boat, be sure to ask the driver to stop off at Thien Mu Pagoda. Located just four kilometers southwest of the Imperial Citadel, this pagoda (a tall, usually highly decorated building used for religious purposes) has seven spectacular storeys. Don’t miss out on the spectacular view of Hue’s surrounding mountains from the back of the pagoda’s grounds. If you want to escape Hue’s busy streets, take a 30-kilometer journey from the city center to the Alba Thanh Tan Hot Springs. Enjoy the mineral springs at the foot of the Truong Son Mountains, while taking in 500,000 square meters of surrounding natural beauty. If you’re more of an adrenaline junkie, be sure to try out the 560-meter-long zip line, along which you’ll experience an exciting 45-meter drop from Ma Yen hill. Hue features lots of sandy stretches. 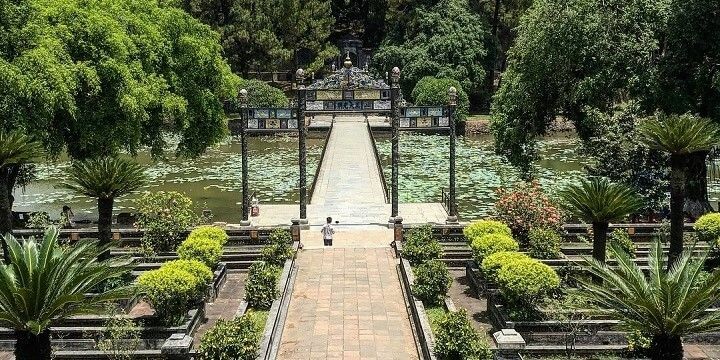 You don’t have to leave Hue to enjoy some peace and quiet, as there are plenty of parks dotted along the river bank, where you can read a book, have a picnic, or people watch in the sun. Alternatively, head to one of Hue’s beaches. 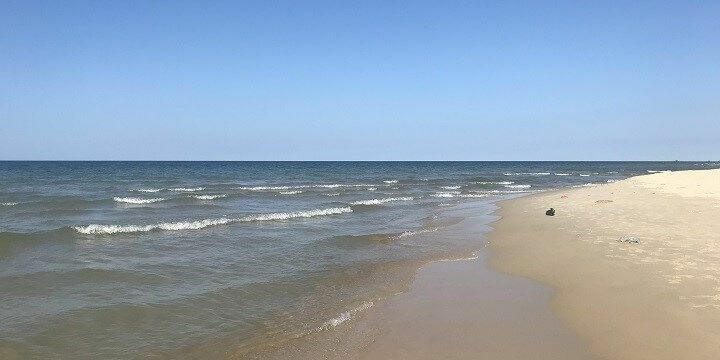 Tuan An beach is the most popular; however, it’s still very underdeveloped, making it the perfect spot to recover from exploring the busy city. The best place to bag yourself some bargains in Hue is the Dong Ba Market, which opens at 3:00 in the morning. Although the market is roughly divided into sections, with the top floor only selling clothing, Dong Ba isn’t particularly well organized, so be prepared to fight the crowds, as the market receives around 6,000 visitors per day. If market stalls aren’t really your scene, head to the city’s Vincom Plaza to enjoy four storeys of fashion, cinema, and food. Vincom Plaza also houses one of Hue’s largest supermarkets, where you can buy local snacks, as well as international treats from back home. Like most of Vietnam, Hue’s curfew means that there can be little to no noise after midnight; however, the city still offers some great pubs and bars. For unbeatable deals, check out Hue’s backpackers’ area, which is home to a number of hostels (many of which have their own bars) and pubs. Most venues host happy hours, during which they serve beer for as little as 8,000 Vietnamese Dong (approx. 0.35 USD). While the particularly cheap venues can get a little rowdy, there are plenty of more peaceful rooftop bars along the riverfront, where you can enjoy a relaxing meal and drink while watching the beautiful sunset. If NextStop24 helped you to choose your next travel destination, we'd be very grateful if you’d search for your accommodation and things to do in Hue through these links. They're affiliate links, which means that we will receive a small commission for every booking made through them. There are no extra costs for you; you'll simply be helping to keep NextStop24 running. Thanks! Lots of sightseeing and culture, some nice beaches.